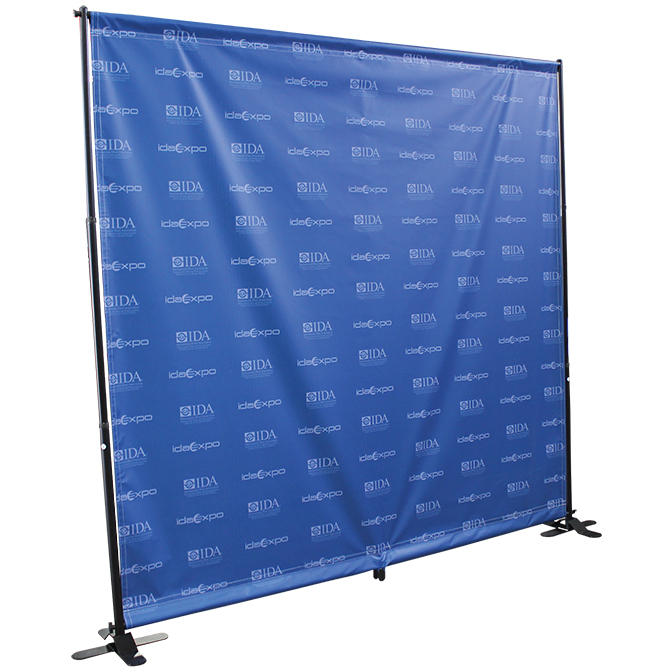 Be ready for photos when you set up your very own Step and Repeat Banner at your next event! With logos regularly spaced across the banner, this creates a muted backdrop perfect for interviews, videos and photo shoots. Designing a Step and Repeat Banner includes choosing the logo or logos that you wish to have across the banner. Then, a complementary color, color scheme, or design needs to be placed behind the logos to create a pleasant-looking banner that won’t detract from the events taking place in front of it. You can send us your logos and design wishes to have our graphics department create your banner or download an easy-to-use template from our Templates Page to lay out your artwork on your own. Step and Repeat Banners are made from high-quality vinyl, printed at our main production facility on our latex printers. Cleaning is simple, with the vinyl repelling water. When cleaning a printed banner be sure to use a soft cloth so that there is no chance of scratching the print during the process. Pockets are sewn along the top and bottom of the banner in order to allow the tubing from the framework to be inserted through the fabric.